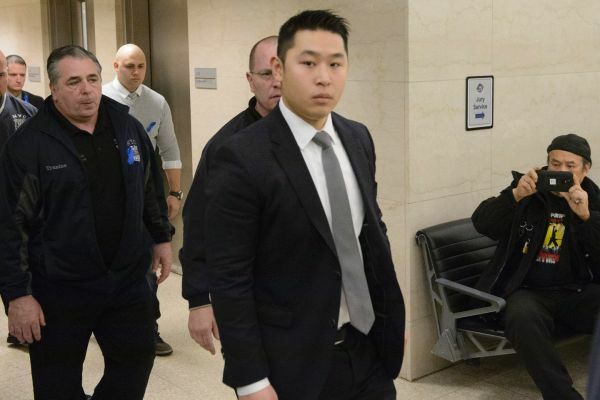 I have written extensively on this case since news of Akai Gurley’s killing first broke in late 2014 and Liang became one of the first police officers in recent memory to be indicted by a grand jury for a civilian shooting. In that time, I have been swayed by the facts of the case to support Liang’s indictment and conviction. I believe Liang and his partner Shaun Landau behaved recklessly and without concern for human life, and that they precipitated the otherwise avoidable death of an innocent, unarmed civilian. I have been further disappointed by those within the Asian American community who demand leniency for Liang using rhetoric that has at times ranged from the disappointingly under-thought to the distressingly anti-black. But, throughout my writing, I have grappled with one issue: how to reconcile my commitment to restorative justice — that is, a belief that we must shift the focus away from offender punishment, and towards offender rehabilitation alongside repair of the crime’s damage to its victim — with my opinion that Liang should face legal accountability for the taking of an innocent life? The crisis of violent policing and racial profiling regimes targeting Black communities is a result of a combination of both outright racism and what that racism has been used to justify: over-policing, over-reliance on incarceration, and police agencies and individual officers who, therefore, have much too much power in situations in which they will necessarily be viewed with hostility by those who are profiled and targeted for the worst of these excesses. This seems to be the case both on the domestic policing front, and in the realm of homeland security, with direct and extraordinarily painful effects on those perceived to be Muslims, Arabs, South Asians, and undocumented Latino immigrants in the U.S. In order to end the repression and violence, we need to fight for fairness within the existing system of justice. Fairness, as defined by that system, is something along the lines of what it appears the people of the City of New York got in the case of Peter Liang. But, we also need to transform the criminal justice system, including by reducing our extraordinary over-reliance on policing and prisons, and the pitiful under-funding of services and social systems that discourage crime in the first place; services and systems that help people to feel less alienated and more included in society like good schools, stable neighborhoods, and real opportunity for secure and dignified employment at decent wages. And, in terms of law enforcement, we need to move away from the gun and the cage as the fulcrum of police power. Our system of “the gun and the cage” relies upon enforcement by police, who must be deemed both criminally unassailable and morally understandable. This is the system that demands our trust in its deeply flawed calculus regarding the relative value of human lives, while it insists that we do not need watchmen for our watchmen. This is the system that indicts only a handful of police officers for on-the-job shootings, and that convicts even fewer. This is the system that would protect the rarely convicted police officer from facing the same sentence that a non-police officer might face if convicted of the same crime. Viewed in that light, we must agree with Nakagawa’s assessment: “In order to end the repression and violence, we need to fight for fairness within the existing system of justice.” We must upend the system, but this transformation must be radical and all-encompassing. We cannot and will not achieve this transformation by demanding selective leniency on the margins for only those most protected by our criminal justice system: our police officers. We also cannot and will not find better justice by papering over the pain of victims and their families, as has happened repeatedly throughout this trial. When those defending Officer Liang argue “he never meant to kill anyone,” they spout the same reasoning Eben and Nitz used to avoid prison for my uncle Vincent’s murder. That’s unacceptable. Despite my copious writing on the subject, I have always felt that Peter Liang’s conviction of second-degree manslaughter is a Pyrrhic victory at best. I believe deeply in prison reform, and am troubled that our jails remain places of inhumane punishment rather than rehabilitative care. I have never thought that Liang should receive the maximum jail sentence suggested for a guilty conviction of second-degree manslaughter — fifteen years. But, if Liang does not deserve to serve time in jail because he lacks a criminal history and poses no threat to society, then the same should be true for the thousands of people — predominantly Black men — who are currently serving “mandatory minimum” sentences despite having little or no criminal record or a history of violence. Yet, when our criminal justice system allows for selective leniency to reflect “punishment [that fits] the criminal” rather than the crime, too often those protections shield the privileged while they victimize the already marginalized. Put more simply: I do not understand how anyone might call it justice that an unarmed Akai Gurley may end up having spent more time in jail for selling small amounts of drugs than Peter Liang might end up serving for killing him.